Lovely frames, made and sent quickly, more than meet my expectations, always! This is a nice frame but unfortunately the pieces weren't cut to make sure they book match on either side or top and bottom. I can live with it but it's pretty noticable. Hello Gerard. Thank you so much for being a loyal Customer! We are pleased that you are satisfied with the frame. Our beautiful Custom frames are available in Custom sizes, and have various rabbets/depths. Unfortunately, we do not offer pattern matching on the corners of our frames. We hope you will continue to shop with us! Thank you for your business. Have a great day! Exceptional quality and beautiful. I am using this frame for my hummingbird paintings. Will need more! I initially went to hobby lobby they charged me around same amount but said it could take upto 2 week’s to get the canvas framed. Here it was easy to visualize how the framed pic would look like so you exactly know what you are buying. With discounts and promotions pictureframe.com is a better buy in all respects. I really like this frame although I thought it was golden it is more like cooper color though. It is well made and the size was perfect. Hello Elbis! Thank you for your valuable feedback. We are so pleased to know that the frame was well made and sized perfectly! Since our beautiful Gold Frames come in various shades of gold ,we strongly recommend ordering samples. We have 3" side samples and corners samples available. If you are not completely satisfied with the color of the frame, we are happy to email you a prepaid return label. If you need more assistance, please give us a call at 1-800-332-8884. Thank you for your business! This frame is even more beautiful than it appears on the website. The shipping was extremely fast and it arrived in a well packed box. Clear instructions on how to mount were included.I would not hesitate to purchase from the vendor again, or this particular frame. It’s lovely. A special frame for a special gift! This was an outstanding frame. The build quality and dimensions were perfect and the mat was also in excellent condition. 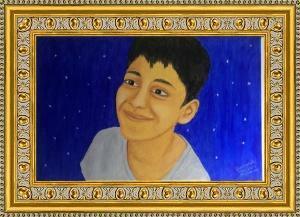 This was the first time I gifted a picture of this magnitude to some one and I was extremely pleased. This was a special gift to my cousin as a surprise after I asked to edit a picture of her from a trip to Rome, Italy. She was floored at the gift needless to say. Thanks to pictureframes.com I will be gifting alot more portraits in the future! Beautiful and Excellent Framework and Printing! Thank you for the wonderful work with my image printing and the beautiful framework. Definitely, I will return! as a customer and would highly recommended your services. 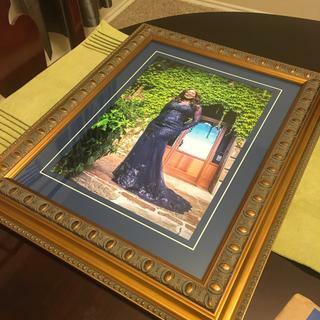 The frame is beautiful; it’s inexpensive; and it was quickly shipped. I’ll repeat business. Such an amazing frame for my oil painting. I went back for another after I saw the quality was superb. This is a beautiful frame -- good quality and construction. I have received numerous compliments. I have never been disappointed in my purchases from pictureframes.com and would highly recommend them. See photos for real life frame. Corners don't match as some are asking about; just depends on how the geometry works out. Beautiful frame . But had to remount the picture and glass 3-4 times , because the gold overlay kept flaking off and got between the glass and the picture. It took a lot of time and work , because I had purchased Three of them. Same problem with all of them. no matter how careful I was the gold which appeared to be over applied on the rear or the frames. The front finish was not a problem, Only the rear. I am sorry to hear you had a hard time with the gold leafing finish. It can be tricky sometimes to manage the static and gold leaf. Please let us know if we can be of further assistance. I'm not sure if you have tried wiping the inside down to knock off the excess leaf. I was disappointed when I received the frame. There is a large-scale pattern along the sides of the frame, with a repeat period of ~1 inch. There was no attempt to center the pattern on the sides. The joints at the corners of the frame are sloppy. You can see light through the jointed areas, and raw wood, in part from where the contours of the design on the sides do not meet properly. 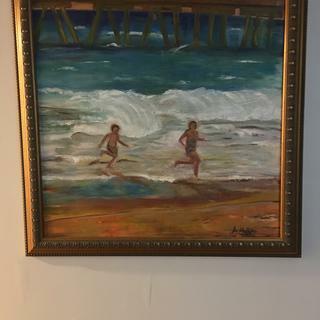 The frame was clearly constructed by simply cutting a piece of molding and stapling it together, with no attention given to making the corners look finished, as they do on the website. The workmanship was mediocre at best. I plan on replacing this frame with a higher-quality one in the future. Hello John. Thank you for your feedback. We sincerely regret that the frame did not demonstrate our excellent craftsmanship. Our Custom Framers put tremendous effort into making sure each frame is designed perfectly. It seems that you experienced a very rare issue with the design on the frame. We are happy to offer you a replacement frame since you are not %100 satisfied with the frame you have. We have a 45 day return policy that allows you to exchange the frame or receive a full refund if you are not satisfied. If you would please email us photos of the frame showing the craftsmanship, that will help us prevent any further assembling issues. We will continue to provide the best products possible. Thank you again for your business! the profile met my needs: wood, gold and not too fussy; and the price was the best of all the frame options that met my needs. It looked most like the gold in the paintings. I HAVE ALREADY PURCHASED 2 OF THESE BEAUTIFUL FRAMES, AND NEED TWO MORE FOR TWO MORE BIRD PAINTINGS. It is the perfect frame for a picture of the Virgin Mary in celestial setting. My seven year old grandson painted an abstract nutcracker. I felt this frame would go well with that era. We are looking to buy the MQ10gold frame for a very beautiful painting of the “Virgin Mary and Jesus Christ child”. We want the frame to be perfect especially the cut at the joints/corners with a simetrical pattern on the sides... the frame sample shown on your webside has perfect joints and patern... Should we expect the same quality? BEST ANSWER: The symmetry of the joint pattern on the frame really will depend on the dimensions of your painting. The first joint cut at 45 degrees will be with symmetrical pattern, but the length of each side from there on out will dictate the cutting pattern for the rest of the frame. Tried to upload pictures as example (but could not). In my first picture is a perfectly cut joint pattern, however for subsequent joints, because of the irregular lengths of each side of my painting, the pattern varies a bit. Overall, I am very happy with the quality and look that I got for my painting, but if you are looking for perfect symmetry, you will need to be very lucky or look for a smooth, non-patterned finish. Hope this helps. It's not about the quality--it's about the size of the frame. The frame stock has a repeating pattern that is the same for all frames. They cut it and build it to your desired size. Unless your frame size is divisible by the width of the pattern repeat, it will not be lined up symmetrically at the joints. My frame was more rectangular than square, so every joint is different. Still, I'm happy with it as it's very beautiful. I doubt anyone notices the joints. The cut at the joints/corners is as good as you could possibly expect. This is a beautiful frame suitable for colonial or neoclassical decor. I have three of these and am very well pleased. They have something similar if you want to mix different styles like I do, so that it doesn't look like everything was mass produced. Here at pictureframes.com, we strive to avoid wasting product. Because of our strong zero landfill policy, we do not pattern match our corners. Thank you for reaching out to us! It’s a great picture frame. I am highly satisfied with the quality and details of it. I want to frame a puzzle with approximate measurements of 36x33 inches. The depth is approximately 1.5". Will the puzzle fit? 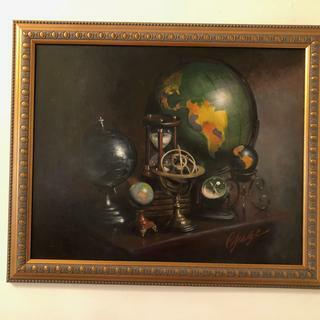 Should I order a backing with the frame? BEST ANSWER: Hi Sharon. This frame has a depth of 13/16", therefore, it will not be able to hold the 1.5" deep puzzle. Our care team can help find the perfect frame for your piece. They are available Monday-Friday 8am-7pm eastern time and can be reached at 1-800-332-8884. Thank you! The front would fit. The back would stick out. I used it with a 1 1/4 “ canvas and the canvas sticks out 5/8 “ in the back. Looks fine on the wall. 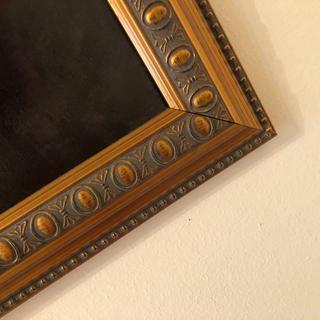 Does this frame come with an easel backing? BEST ANSWER: H, thank you for asking. This lovely gold frame does not come with an easel back. Only our Tabletop frames come with an easel. You can find them at this link. https://www.pictureframes.com/Ready-Made-Tabletop-Picture-Frames . We do offer the easel backs separate at this page ; https://www.pictureframes.com/framing-supplies/easel-back, however they are only available in standard sizes such as 4x6, 5x7, 8x10 and 8 1/2"x 11. We hope that this is helpful! My artwork is on the board that is 0.5 inch thick. Do you make frames that will fit that? BEST ANSWER: Hello Tanya! This gorgeous frame has a rabbet/depth of 13"/16" which will fit with a 1/2" thick board. If you need more assistance, please let us know. Happy Framing! My print is a stretched canvas...26x36. I’ve ordered canvas clips. Anything else I need to keep in mind? I’m ordering MQ10 gold Thanks! BEST ANSWER: Hello Eliza! This frame will work great with your canvas. Please consider mounting the canvas to a 'mounting board' so that the canvas will have more stability in the frame. You can adhere the canvas to the mounting board with an adhesive such as double sided tape. The canvas clips are not necessary unless the canvas is deeper than the frame's rabbet/depth. Please give us a call at 1-800-332-8884, if you need further assistance. Thanks! BEST ANSWER: Hello! The 'lip' of the frame will cover 3/8" of your artwork. Please order size 26"x36" exactly and keep in mind the 2 5/8" width of the frame will not cover the artwork. Thank you for your inquiry.